It seems like everyone has an opinion about home prices. One of my clients is waiting for the prices to go down. He thinks everyone is dropping their prices. Some people do when they start to high in pricing their homes. Today, I’m going to share with you the real numbers for Corona CA Real Estate February 2019 Market Trends vs 2018. Then, you can see for yourself the real estate trends for Corona homes in 2019. If you are thinking about buying real estate in Corona California or selling there, take a few minutes to review the current market statistics and trends. 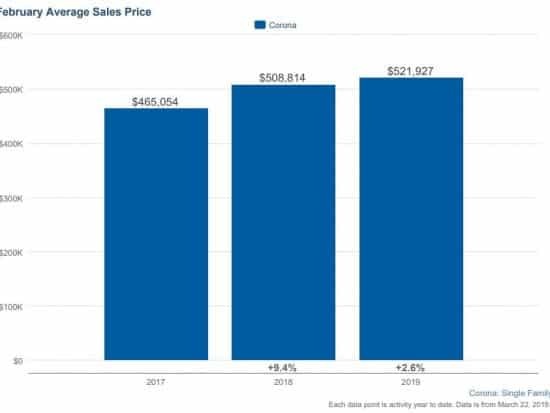 In this short video, I review the average selling price of Corona homes are at $521,927 in February 2019 vs $508,814 in February 2018…and more details in the video that I think you will find informative. All of the real estate data is from the California Regional Multiple Listing service not from online marketing magazines like Zillow, Trulia or any other website. How Flexible are Corona California Prices? In 2019, homeowners are selling their homes for 97.60% of the listed price. The more competition, the more flexible the prices are going to be in most markets. Thinking of Selling Your Corona Home in 2019? Then, lets meet and talk about how the Corona CA real estate February 2019 sales to see how it affects your current market value. The sales numbers in my report above reflect all single family homes in the city of Corona. Your market value may be higher or lower than the average. Let’s meet today. For all listings in Corona California, go to homes for sale in Corona, California.